Oral hygiene is the practice of keeping the mouth clean and healthy by brushing and flossing to prevent tooth decay and gum disease. The purpose of oral hygiene is to prevent the buildup of plaque, the sticky film of bacteria and food that forms on the teeth. Plaque adheres to the crevices and fissures of the teeth and generates acids that, when not removed on a regular basis, slowly eat away, or decay, the protective enamel surface of the teeth, causing holes (cavities) to form. Plaque also irritates gums and can lead to gum disease, periodontal disease , and tooth loss. Brushing and flossing removes plaque from teeth, and antiseptic mouthwashes kill some of the bacteria that help form plaque. Fluoride, found in toothpaste, drinking water, or dental treatments, also helps to protect teeth by binding with enamel to make it stronger. In addition to such daily oral care, regular visits to the dentist promote oral health. Preventative services that the dentist can perform include fluoride treatments, sealant application, and scaling (scraping off the hardened plaque, called tartar). The dentist can also perform such diagnostic services as x-ray imaging and such treatments as filling cavities. The Centers for Disease Control and Prevention report that dental caries are perhaps the most prevalent of infectious diseases in children. More than 40 percent of all children have cavities by the time they reach kindergarten. It is, therefore, imperative that all parents learn the importance of early oral care and that they teach their children proper oral hygiene. Good oral hygiene should start at the very beginning of a child's life. Even before his or her first teeth emerge, certain factors can affect their future appearance and health. Pregnant and nursing mothers should be careful about using medications, as some, like the antibiotic tetracycline, can cause tooth discoloration. Even before infants have teeth, they have special oral hygiene needs about which all parents should be aware. These include making certain the child receives adequate fluoride and guarding against baby bottle decay. Fluoride is beneficial for babies even before their teeth erupt. It makes the tooth enamel stronger as the teeth are developing. In most municipal water supplies, the correct amount of fluoride is added for proper tooth development. If the water supply does not contain enough fluoride or if bottled water is used for drinking and cooking, the doctor or dentist should be informed. They may prescribe fluoride supplements for the baby. Baby bottle decay is caused by recurring exposure over time to sugary liquids. These include milk, formula, and fruit juices. These liquids pool for prolonged periods of time as the child sleeps. This exposure can lead to cavities forming, especially in the upper and lower front teeth. For this reason, children should not be allowed to fall asleep with a bottle of juice or milk in their mouths. An alternative is to give the child a bottle filled with water or a pacifier recommended by the dentist. Even breast-fed children are at risk. They should have their gums and teeth wiped with a clean, damp washcloth or gauze pad following each feeding. Baby teeth, also known as primary teeth, are just as important as permanent teeth. They help the child to bite and chew food, help them speak correctly, save space for the child's permanent teeth, and help guide the permanent teeth into place. That is why it is so important to initiate a program of good oral hygiene for children early on. Once a baby has four teeth in a row, either on top or on the bottom, parents should begin using a toothbrush two times a day. When choosing a toothbrush, make sure the bristles are soft, polished, and made of nylon. Parents should administer only a pea-size amount of fluoride toothpaste that is made especially for children. Children tend to swallow, instead of spit out, toothpaste. If the child does not like the flavor of the toothpaste, using water alone is acceptable. Parents should also continue to wipe the toothless gum areas with a washcloth or gauze. As the child gets older, parents should demonstrate proper brushing techniques. These include brushing the inside surface of each tooth first, where plaque tends to accumulate most. Then they should clean the outer surfaces of each tooth, angling the brush along the outer gum line. Next, they should brush the chewing surface of each tooth, then using the tip of the brush, clean behind each front tooth. They should use a gentle, back and forth motion when brushing and finish by brushing the tongue. A boy flosses his teeth as part of a daily regimen for good oral hygiene. pay special attention to the molars, as these teeth have lots of tiny grooves and crevices where food particles can hide. Good oral hygiene remains important as children grow into adolescence . In fact, adolescence can often be a time when cavities and periodontal disease happen more frequently. This higher rate is usually caused by an increased intake of junk food and sugary foods such as soft drinks, as well as inattention to oral hygiene procedures. Add to that the fact that many older children and teens wear braces, making the cleaning of teeth even more challenging. Parents should talk to their children about how important good oral hygiene is in preventing not only cavities, but teeth stains, bad breath, and an assortment of other dental problems. Flossing once a day helps to prevent gum disease by removing food particles and plaque at and below the gum line, as well as between teeth. Parents do not need to initiate flossing until the child has teeth that touch each other, which normally occurs in the molar areas first. 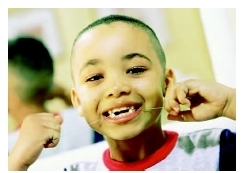 Parents should continue to floss their child's teeth until they are six or seven years old. They should continue to monitor the child's techniques and consistency thereafter. Proper flossing technique is essential in removing as much plaque as possible in a safe manner. The following procedure is recommended by dental hygienists. Wind 18 inches (45 cm) of dental floss around the middle fingers of each hand. Pinch the floss between the thumbs and index fingers, leaving about 1–2 inches (3–5 cm) length in between. Use the thumbs to direct the floss between the upper teeth. Try to keep the floss taut between the fingers. Use the index fingers to guide floss between lower teeth. Gently guide the floss between the teeth by using a zig-zag motion. Contour the floss around the side of each tooth. Slide the dental floss up and down against the tooth surface and under the gum line. Floss each tooth thoroughly with a clean section of floss. Dental floss comes in many varieties (waxed, unwaxed, flavored, tape) and may be chosen based on personal preference. For those who have difficulty handling floss, floss holders and other types of interdental (between the teeth) cleaning aids are available. Some floss holders have animal and cartoon characters on them, which might make flossing more appealing to a child. It is important that younger children only use a very small amount of fluoridated toothpaste since using too much fluoride can be toxic to infants. Though brushing and flossing are important, neither should be performed too vigorously. The rough mechanical action may irritate or damage oral tissues. Parents should change their child's toothbrush three to four times a year and after every illness to avoid bacteria and germs. Another factor that may affect a child's oral health is the increasingly popular practice among adolescents of oral piercings involving the tongue, lips, and cheeks. These piercings have been associated with infections, tooth fractures, periodontal disease, and nerve damage. Some life-threatening complications have occurred, including bleeding and airway obstruction. The American Academy of Pediatric Dentistry strongly opposes the practice of oral piercings. The primary risks arise from a lack of proper oral hygiene practices. These major oral health problems are plaque, tartar, gingivitis, periodontitis, and tooth decay. Parents play an important role in both modeling and teaching good oral hygiene. Parents can make sure their child sees a dentist before the age of two. This can be a frightening experience for some children, but if parents exhibit a positive attitude, most children become comfortable with dentist visits. Children who learn proper oral care at a young age benefit from those good habits for the rest of their lives. Calculus —Plural, calculi. Any type of hard concretion (stone) in the body, but usually found in the gallbladder, pancreas, and kidneys. They are formed by the accumulation of excess mineral salts and other organic material such as blood or mucous. Calculi (pl.) can cause problems by lodging in and obstructing the proper flow of fluids, such as bile to the intestines or urine to the bladder. In dentistry, calculus refers to a hardened yellow or brown mineral deposit from unremoved plaque, also called tartar. Gingivitis —Inflammation of the gums in which the margins of the gums near the teeth are red, puffy, and bleeding. It is most often due to poor dental hygiene. Pediatric dentistry —The dental specialty concerned with the dental treatment of children and adolescents. Sutton, Amy. Dental Care and Oral Health Sourcebook: Basic Consumer Health Information about Dental Care . . . Detroit, MI: Omnigraphics, 2003. Vogel, Elizabeth. Brushing My Teeth. New York: Rosen Publishing Group, 2001. Garwood, Derrick. "Oral Hygiene." The Pharmaceutical Journal 270 (May 3, 2003): 619–21. American Academy of Pediatric Dentistry. 211 East Chicago Avenue, Suite 700, Chicago, IL 60611. Web site: http://www.aapd.org. American Dental Hygienists' Association. 444 North Michigan Avenue, Suite 3400, Chicago, IL 60611. Web site: http://www.adha.org. "Oral Health Resources." Centers for Disease Control and Prevention. Available online at http://www.cdc.gov/OralHealth/index.htm (accessed October 26, 2004).